* While the A-336 Lok-A-Loy Connecting Link is still very popular, be advised it is made from Grade 63 Alloy Steel, which is no longer the common standard for overhead lifting. 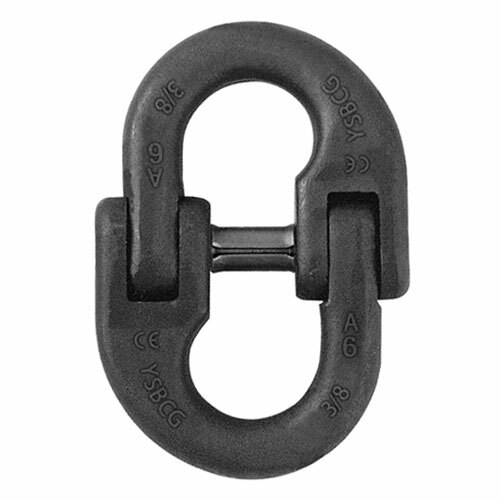 Most overhead lifting chains are now made from Grade 100 or Grade 80 Alloy Steel. If you choose to use this connecting link as part of an overhead lifting chain sling, be advised you must downrate the assembly to compensate for the reduced capacity of this connecting link. Alternatively, you can look at the Crosby A-1337 Grade 100 Lok-A-Loy Connecting Links, which are fully rated for use with Grade 100 or Grade 80 chain systems.